(CNN) – Obama campaign senior adviser David Axelrod said Sunday that President Barack Obama was “taken aback at the brazenness” of Mitt Romney’s departure from his past positions during their first debate. The Obama campaign will adjust accordingly for the next debate, he said. “I think he was a little taken aback at the brazenness with which Gov. Romney walked away from so many of the positions on which he's run, walked away from his record,” Axelrod said on CBS’s “Face the Nation.” He said the positions Romney took during Wednesday’s debate were “uprooted” from the Republican candidate’s previous positions. “What happened was the president showed up with the intent of answering questions and having a discussion, an honest discussion about where we go as a country,” Axelrod said, though conceding that Romney had performed well. Axelrod said Romney was dishonest during the debate, pointing to a contentious charge Obama waged Wednesday evening about his opponent’s tax plan involving $5 trillion in cuts for the wealthy - a claim CNN has rated as false. Republicans have pushed back on the president’s claim about $5 trillion in tax cuts, with Romney's team releasing an ad Sunday challenging the president's attacks and asserting the GOP nominee's tax plan would not add to the deficit. Romney has said that his tax plan would close loopholes, though he has not specified which ones, and increase economic activity, resulting in increased federal government revenues. Much to Democrats’ dismay, Obama did not use the proven-effective attack line about his opponent’s now-infamous “47%” comments. 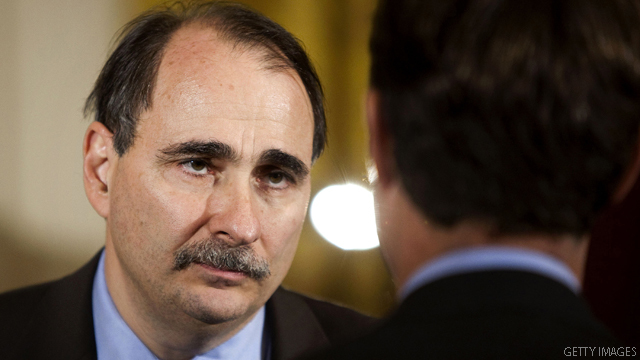 Axelrod explained that Obama didn’t see an “appropriate opportunity” to level the charge. “The president was earnestly trying to answer questions that were asked on the topics that were being discussed, and he didn’t find the opportunity to raise it. And it’s obviously well known,” Axelrod said. Philadelphia Mayor Michael Nutter, a Democrat, also said Sunday that Romney was being dishonest during the first debate, but predicted that Obama would refute the GOP nominee’s claims and hammer home his own message in the next two presidential debates. Lies? I seem to remember very early Obama was asked if he intended to run for president. He said no. I seem to remember Obama promising to halve the deficit in his first term. And didn't he say No one making less than $200,000.00 a year would not have their Taxes raised one dime. And if the stimulus was passed unemployment would be 5.6 percent by now. Obama is probably not dishonest, just lacking. This is Axelrod goading Mitt into going overboard at the next debate. If he does that, he'll undo all the winning he did at the first one. The reason being that the next debate is on foreign policy, Obama's strength in these elections (compared to the economy), and Mitt's tactics will fail. Why? How did he think it would go? (His party has been criticizing Mr Romney for months, for goodness sake.) You know, I would buy that Mr. Obama underestimated his opponent, or that he was ill prepared to defend his record. But "taken aback" by direct criticism? And, further, unable to adapt, and pull himself together. This is an explanation? Why, I wonder, how did he think it would go? I am surprised he was apparently so ill-prepared. Of, if he was prepared, how poorly he delt with the situation. Called it what you want to Mr Axelrod. This guy is a Liar, and you cannot debate a liar. You simply cannot debate a Liar. John McCain said it when he ran against Romney in 2007. He said " how can you debate a Liar. Romney is a LIAR.